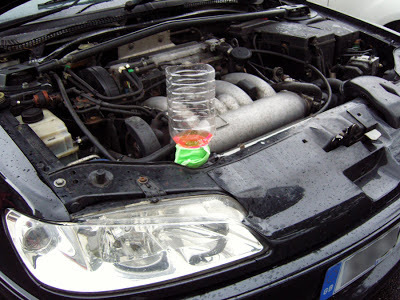 In this post we will show you, step by step, how to change the thermostat in your Peugeot 306 GTI-6 and bleed the cooling system. Incorrect running temperature can cause poor fuel economy and engine damage. Probably the most common and cheapest fix for this is to replace the thermostat which as we explained in this post, controls the flow of coolant to the radiator. A broken thermostat on your Peugeot 306 can cause both hot and cold running. The parts for this job are very cheap, I recently bought a thermostat and seal from ECP for under £10 and don't forget to get some more coolant as well. The Peugeot 306 GTI-6 uses an 83 degree C thermostat, before starting to take anything apart it is worth checking the new thermostat you have is correct - the opening temperature of the thermostat should be engraved into the metal body somewhere. Unless you like 90 degree coolant on your hands make sure the car is cool before starting. 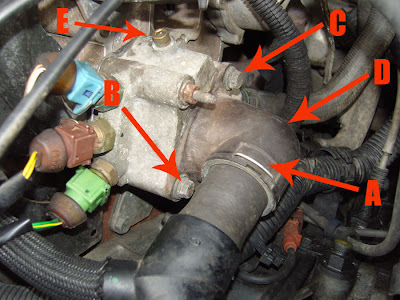 Follow the top hose from the radiator towards the engine block and you will come to the thermostat housing. To access the thermostat you will need to remove the black plastic right-angled hose thing which is held in place by 3 x 10mm bolts (B, C and D (round the back)). You won't be able to remove B without first removing the coolant hose. Pull the C-Clip off (A) and then the hose will just pull out. As you can see B and C are standard bolts but D is like the the un-labelled rusty nut with the thread sticking out and will require a deep socket or ring spanner. Before doing this you might want to put a plastic bag or something over the loom and connectors which are below. At this point I moved the throttle cable and zip tied the hose out of the way for easier access. Once the 3 bolts are removed give the plastic housing a little tug and it will come off to reveal the thermostat which simply pulls out. When you remove this quite a bit of coolant will come out. "Fitting is the reverse of removal"
Now it's time to refill the lost coolant and bleed the system of air. First off make an extended header tank out of an old lemonade or squash bottle, this will help you to use good old fashioned gravity to do the hard work for you. 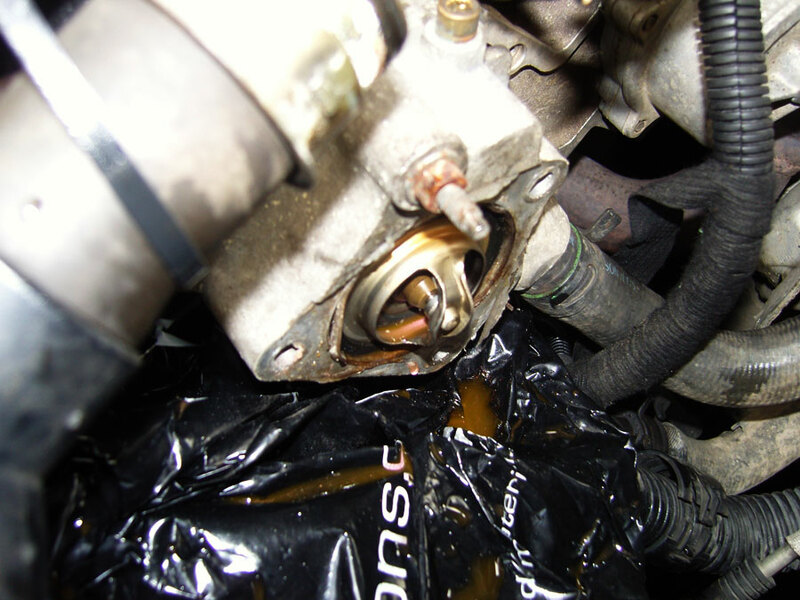 Wrap the end in a cloth or tape so it makes a seal around the radiator filling cap. Fill this header tank with coolant and open the brass bleed screw (E) to enable the trapped air to escape, now start the car up and let it get up to temperature so the thermostat opens up. 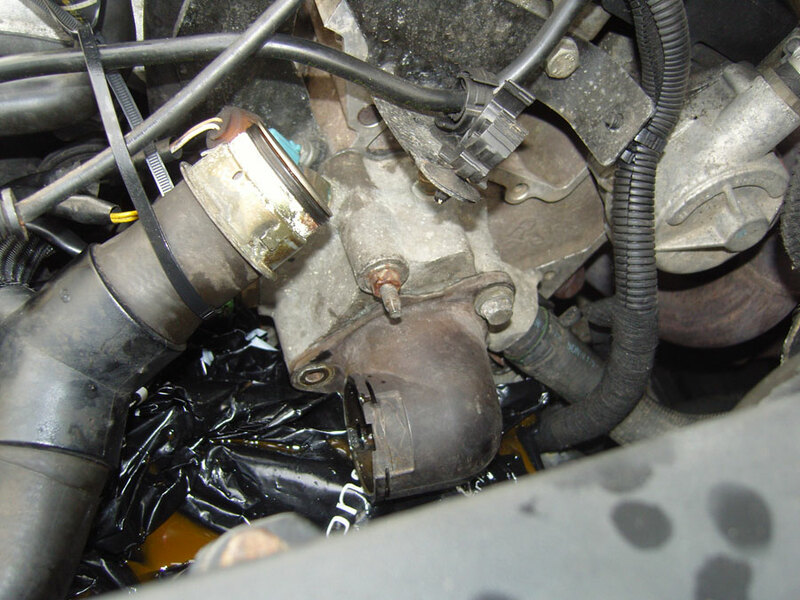 As the engine is running you should notice the coolant in your header tank start to drop, carry on topping this up. Periodically hold the revs at ~3,000rpm for about 15 seconds, you should find that doing this will cause bubbles in your header tank and it will also swallow lots of the coolant. Once the car is up to temperature turn the fans to hot and full power, if you have done a good job so far the air should be nice and hot. If not there is still trapped air in the system. Check the thermostat bleed point again and if there is coolant running from it then gently nip it up. If you are reading this post you might also be interested in our radiator fitting guide for the Peugeot 306 GTi. All comments welcome below, you don't need to register to post. You do not mention the bleed point on the heater matrix pipes on the bulkhead. this is higher than the thermostat bleed point and can trap air. I found this in my 405 when the heater matrix was replaced. (I also have a 306hdi). I think though that once this is bled it should not need to be done again when the thermostat is replaced. Anyway very clear instruction. Good point Ray - if anyone is interested the bleed point on the heater matrix is located on the left hand side of the bulk head. It is advisable to bleed from this point but strangely it's never been required when i've done it (and this included changing a radiator).